Last year was a blur of surgical gowns, IV tubing, and those grippy hospital socks. Anna was sick. She had severe digestive issues that brought us all to our knees, day after day. Many nights were spent in the bathroom, with Anna leaning over the toilet, while I held her hair and rubbed her back. She went through a series of tests — endoscopies, blood tests, biopsies and more — before we finally landed at Mayo Clinic. A year later, she’s better — like a new girl, really. Doctors at Mayo discovered the sources of her digestive problems, and we are so grateful to have a long-term plan in place for her care. One of the things about going through a medical trial like that is learning the art of surrender. I am wired to be a “fixer,” especially when people I love are hurting. I’d do anything to keep my loved ones from pain. But I learned a hard lesson in Mayo, when I came to the painful realization that I had no control over outcomes. I felt powerless, and even in prayer, I had to fall back on wordless groans. Surrender often looks like this: releasing our child into the arms of strangers — nurses, anesthesiologists, surgeons. If you’ve ever had a child go through a medical procedure, you know how hard it is to put on a brave face for your kid while a woman in scrubs wheels your child away from you, through the operating-room doors. Her eyes were wide, and she’d just nod, while a single tear crept down her cheek. Meanwhile, there was almost always a nurse or an attendant, waiting and listening by the door, giving us the time we needed to let our girl know she was going to be ok. Sometimes, I’d see out of the corner of my eye how they bowed their heads when my husband or I prayed. Those “strangers in scrubs” have a lot to teach us about what it means to be the face of hope to people who are going through hard times. I know that you don’t have to be a Christian to be a good doctor or a nurse. But there was a palpable peace in the room during those moments when our daughter’s caregivers revealed their personal belief in Jesus — and in the power of prayer. I am so grateful for the people who treated us with dignity when they allowed us a few extra minutes to pray over our daughter. Today, I thank God for doctors like that pediatric surgeon who have the humility to pray. I thank God for surgeons who know that their gifts don’t come merely from medical textbooks — they come from the Lord. I thank God for nurses who give patients a few extra minutes to pray our choked-up prayers. I thank God for anesthesiologists who bow their heads when we bow ours. I thank God for medical personnel who aren’t afraid to call out miracles when they see them. This week, some of you are facing a medical crisis of your own. Some of you might even be reading these words from inside a hospital. If that’s you, don’t be afraid to express your need for prayer. Keep your eyes open for the miracles. That miracle might be the scrub-wearing attendant who steps into the room. Maybe you’re not in the hospital today. But chances are, someday you will be. And when your loved one is wheeled through the operating-room doors, may you feel the palpable peace of knowing that God goes with the one you love — present in places you can’t go. YOUR TURN: Do you have a story about the faith of a doctor, a miracle in the operating room, a nurse who prayed? Share in the comments. RELATED VIDEO: Dr Jane Bates, a palliative care physician in Malawi, gives insights into how she thinks Christian doctors can tackle the call to pray. Our featured writer this week is Dawn Boyer. She writes about grace, the power of our testimonies, and Anna from Luke 2. This story is special to me because, as you know, one of my daughters is named Anna. Find Dawn here. This resonates so much with me this week. Last Saturday I watched my five year old put under general anesthetic – just for stitches on her head, but distressing for me. As I prayed while sitting in the waiting room I felt how wonderful it would have been to know others were praying in the hospital with me and not just for us but for all the operations going on that day. It’s good to be reminded that many of the doctors and nurses are praying as they go about their daily routines. These are such encouraging words. Both times that my husband faced surgeries this past year, there was a nurse present who was so kind that she reminded us of our good friend, who is a surgical nurse. This friend is a calming presence in every procedure she is a part of, even when she can’t speak the name of Jesus outloud. Thank God for caring medical professionals! So cool to hear about your friend who is such a calming presence. 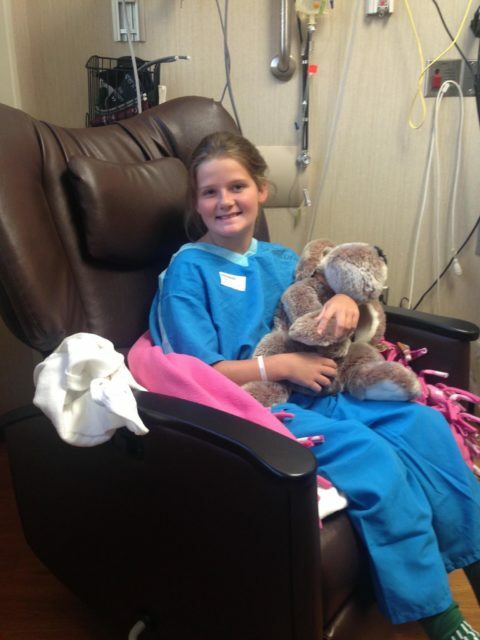 Jennifer, what an encouraging post…facing hospital stays often brings fear or dread. Yet, I can know that there are Christian doctors and nurses, staff who are caring enough to pause while the family prays together, gives me a joy that delivers peace to my heart. I fall to my knees, knowing that that is where I must start, placing myself or my husband in His hands first. God holds those hands of the doctors and nurses. What a powerful testimony of the doctor who looks at his hands and thanks God. Praising our Creator. This is so amazing, Jennifer. I’m so grateful Anna is so much better. I’ve been wondering a lot about her. And what a blessing to have believing and praying caregivers. I hope you’re having a wonderful week! Hugs! She is so much better. Thank you, Trudy! This beautiful piece serves as a reminder to those of us in the medical field to be bold in our faith and tender with those whom we serve. Blessings to you and Anna. I loved this piece. I am going to forward it on to a few doctors I know. Grateful. So glad these words encouraged you, Maree. Oh, boy! When Pedro went through his non-Hodgkin’s Lymphoma with central nervous sytem involvement battle it came to a point where doctors would come in and sit on the side of his bed. This is not a good thing in a teaching hospital (University of California San Francisco) where scienc rules and God is never spoken of. At one point, our minister came down and annointed Pedro–and things got worse. Pedro developed a yeast infection in his blood right after receiving a round of chemo–there was nothing left in his body to fight off the infection. One of the attending physicians was pretty sure that he knew which drug would work for fighting the infection, but it didn’t have FDA approval for blood yeast infections. The doctor had to go to the hospital board to get authorization to use the drug–I heard he actually told the hospital board that he was going to use it to save a patient’s life whether they approved it or not. He ordered the drug, and the nurses started administering it. At the same time, we started looking for white blood cell donors and called upon all of our praying friends to start praying hard. Twelve hours later, when they checked Pedro’s blood counts, his body had miraculously started producing white blood cells three days ahead of time. Between the medicine and the increased white blood cells, Pedro became the poster child for Miracles Still Happen on the Cancer Ward. A year later, when Pedro strode into the outpatient office and just happened to have this same attending physician as his doctor of the day, we considered it another miracle. Dr. Doom (his nickname) jumped up from his chair and rushed over to shake Pedro’s hand. “You’re a walknig miracle!” he exclaimed. He also called everyone else in to see Pedro, too. I’ll be forever grateful to Dr. Doom for putting his career on the line to do what he knew was right, even if he couldn’t prove it before hand. I don’t know where Dr. Doom stood spiritually, but I DO know that after helping Pedro, he firmly believed in miracles! Wow! What a terrific story, Anita! And thanks for sharing the link too. This is wonderful, Jennifer! First, let me say how glad I am that your precious Anna is better. Second, isn’t the Mayo Clinic amazing? I’ll never forget taking two of my boys there, all by myself, back in 1998. I felt so small in such a big world…but the medical professionals were so kind, so caring. And I know something of what you’ve experienced this past year, having been through multiple surgeries with my sons and my husband, all of whom have a rare genetic disorder. My friend Richard Foster always prays for “God’s friends, the doctors” when he prays for a sick person. And when my son was facing major open-heart surgery, I’ll never forget how Richard prayed for angelic protection–he asked God for “perhaps three big, strong angels” to stand guard around the operating table. What a picture that formed in my heart! Oh my goodness…. Richard’s imagery brings goosebumps! Thank you for these beautiful words Jennifer. I love the timeliness of your post because our series at church right now is The God of Miracles. Blessings! How cool! Thanks for sharing, Mary. I was so blessed by your faith in that trial you mentioned, so encouraged at the way you continued to praise God and bravely encourage others when you were bearing a burden of unknown. Our oldest spent a good part of her first years of life in the hospital and many trips after, and it was some of the most difficult and most heart ripping moments I have known. The unknown…the inability to make them whole… I don’t know how people do it without prayer and faith and Jesus. I am so glad to know she is doing better. Blessed to know the way He orchestrated people of faith to witness to you and stand alongside you. And friend, can I please say thank you for your gentle gift of encouragement for sharing my post about Anna and her testimony. It has wrecked me… it has been a moment of revelation at the way she waited for God faithfully. I want to be like Anna, and maybe too… like your sweet Anna, full of joy and child-like faith and trust. Dawn, It’s as joy to share your words. You truly shine, my friend. Thank you for sharing about this hard time in your walk — such a challenge to suffer along with a loved one and to be present for them in meaningful ways when your heart is broken for them. I have a son going into the medical field, and am so thankful for his caring heart, knowing that he has chosen his field because of sports-related injuries he sustained and the example of caring professionals who served — and encouraged — him. I have no doubt that you raised that boy up to give God all the glory, Michele. You are such a blessing. So glad she is better. Prayers answered! Thanks for hosting! Oh, Jennifer, I had no idea until now what challenges you all faced with Anna’s illness. Thanks be to God that she is better! And thanks to all the medical professionals who respect, honor, and/or join in prayer for patients and their families. They are truly a blessing! May God continue to bless you and yours! It was a long road — about two years, and actually a lot of it goes back to birth. We are grateful for answers. She’s like a new kid! I am a nurse in a large Medical clinic. I have prayed numerous times with patients. I always ask if they would mind and it’s when warranted. I have prayed Gods healing over people and for women who have had abortions to feel Gods love and forgiveness. I hid a teenage abortion for 28 years. I felt guilt and shame even after I became saved. Then a beautiful disciple of Jesus walked me through feeling forgiven. God knew what he was doing when I later got assigned to women’s health on a monthly basis. I am honored to pray for others. It’s a beautiful thing to see the broken women FEEL forgiven and beautiful. When my Dad was in the ICU at the end of his life, we had the most amazing nurse. She took care of my sister and I at least as much as our father. And when there was nothing else to do, she prayed with us and for us. I will be forever grateful for Nurse Tammi. Beautiful. Thanks for sharing, Liz. Jennifer, I’m so glad the doctors have found some answers for Anna! My husband recently had a cochlear implant and the process is a long one; we began about 2 years ago. We have indeed been praying often in the hospital and recovery rooms. Staff are always so sensitive and patient to that. I think anyone in the caregiving business knows that doctors do the surgery but only God does the healing. Thank you for your encouraging words today. A close friend of mine is in the hospital right now. I’m going to text her the link to this post. Prayer is powerful! I hope the words give her some hope and encouragement today, Kelly. When I had a devastating miscarriage and needed to have pre-op blood work done the day before the dreaded procedure, the nurse who took my blood saw that I was so upset and crying. She hugged me and asked if she could pray over me. She prayed so intently for me to have strength and peace that day and the next. My eyes were so blurry with tears, but I managed to look at her name tag. I always think about that baby who would have been my fifth, but I know he or she was surrounded by love from the beginning, and Jesus sent me someone in my most painful hour to remind me of love’s endurance. Thank you for responding! I am amazed at how Jesus communicates through others. 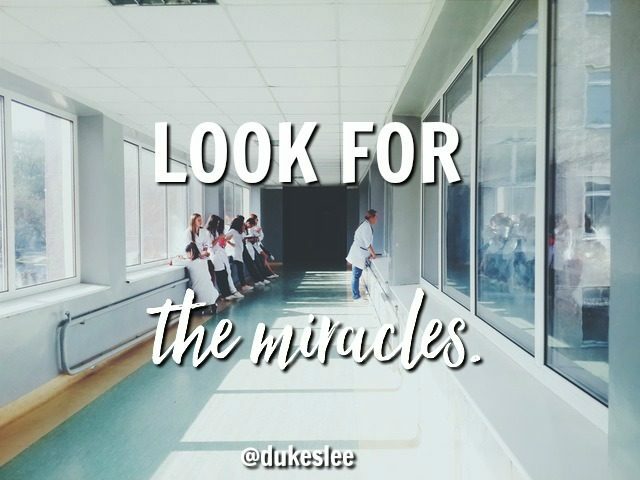 Thank you for the encouragement to look for miracles! I love your words today, Jennifer. My oldest is in medical school, his wife is an ER nurse; my next oldest daughter is a burn ICU nurse and I have another prepping for physical therapy. My oldest two already in the field look for ways to pray with their patients and share the love of Christ. They will often text me to pray for a patient in need. ::tears:: God’s church is wide. What a blessing to care for souls as much as health. Wow. I love that, Lisa. We are incredibly grateful for answers. We’re so glad you’re here, Debbie. Thanks for your kind words this week. When our son was 4, he was diagnosed with a kidney condition and admitted to the hospital. His pediatrician placed the stethoscope to his heart and in an effort to entertain him asked, “What do you think I’ll hear?” I’ll never forget his sweet little response, “Jesus. He lives in there. Does He live in your heart too?” Her eyes swelled with tears and she said, “Yes, He does.” It was an instant connection between us and her, and 10 years later, she still rejoices with us over the fact that God healed our son of what even she thought would last a lifetime. Faith matters and prayer changes things, it’s just as beautiful as that. WOW WOW WOW! Such a cool story! What a beautiful tribute to your faith…in God and the people He gives us to help those we love most! My father had been in and out of the hospital starting back in October. He is only 73. He spent the first 2 months of this year in the hospital with the majority of the time in ICU. I was so scared it was the end but I continued to pray and all of my friends and family prayed for him and the doctors. Two weeks ago he was transferred out of ICU and into a rehab facility. He is slowly getting his strength back to walk and eat. The power of prayer has been an eye opener for me! He will never be the same physically but he is back mentally and I am so greatfull to have even one more day with him! Praying for your dad right now, Christy. My Dad had a 17 hour surgery 7 years ago to remove a tumor from his brain stem. The doctor called him his miracle patient. The whole staff made us feel loved. Caring physicians are such a blessing! Such a great story. Thanks, Julie! So grateful you’ve received some answers, Jennifer. We are too. She is like a new kid! Still bumps in the road, but almost a full 180 turn. So glad to hear the outcome and that in spite of the difficulty, you received answers and proper treatement. My daughter was in the hospital all week, and it is difficult when doctors don’t know what is happening and how to treat it. I’ve never been in a situation where doctors prayed for wisdom and healing but I can imagine the comfort and strength this would bring…not to mention the testimony of faith! Tears pricked my eyes as I read this post. I felt your helplessness that reduced prayers to groans because I’ve been there too. And my heart overflowed with gratitude to hear about such humble, caring doctors and nurses who pray for their patients and proclaim the miracles when they see them. Last, I’m praising God with you that all the trauma and tests and “testings” came to a joy-filled conclusion for Anna. Glory to God for his awesome works!